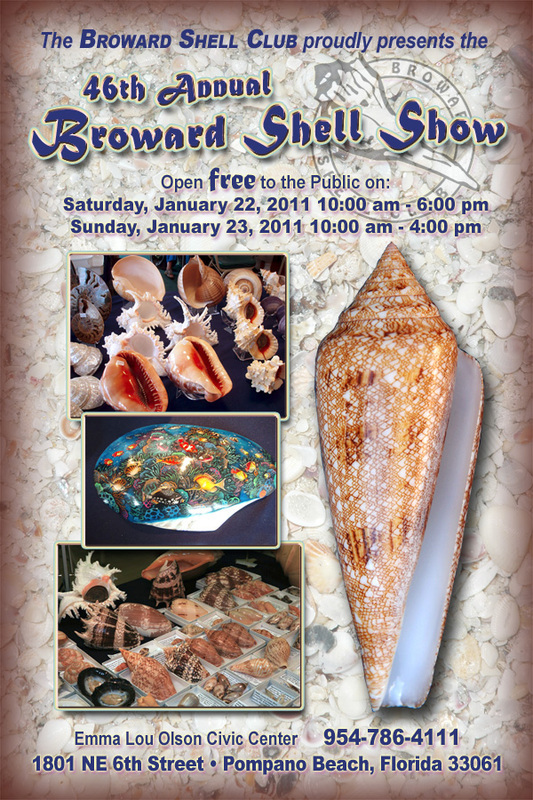 The 2011 Broward Shell Show was a success! We had a huge turnout from local residents and increased our membership by 1/3, with many new members attending our monthly meeting on February 9th. We had positive feedback from dealers, exhibitors, members and attendees, many who look forward to the 2012 show. It takes a lot of effort to make a successful shell show………..
Bob Pace, the club’s unsung hero, who has worked so diligently for the past two years as club president, and for his many contributions at the show including making some of the coolest shell critters ever!! Ike Alvo, who truly made it possible for us to have a show this year when we had enormous rent hikes at the Civic Center; coordinating with the city and the State of Florida to register us properly for the show. Richard Sedlak, who was in charge of the Show Set-up committee, the Judge’s Dinner Coordinator (and provider of those beautiful centerpieces), plus many extra trips to the store and warehouse for the show. Judges: Bill Lyons, John Slapcinsky, Phyllis Gray and Randy Leibig – You took your responsibilities very seriously and we appreciate you giving us your time and efforts. Exhibitors: We so enjoyed your exhibits. Thank you!!! Linda Zylman-Holzinger – Shell Sales table chair – Great job! We made over $2,000 at this table. Bob Pace – Shell Art Sales Table Chair – Great Job! We made over $1,600 at this table. Raffle Table – Sonny Ogden – Great job! We made $800 on the raffle. Publicity – Carole Marshall – You coordinated the making of the programs and, most importantly, you solicitied all the program sponsors, who paid for the entire program with their donations and ads. Membership and exhibitor mailing: Heather Strawbridge – You are so appreciated. Volunteers at the Show, Sales and Raffle table volunteers: Set up and breakdown, working sales tables, placing signs, lunch team, Shell ID Clinic, etc. – John Slapcinsky, Harry Lee, Kimi Kadota, Andrea Diskin, Ike Alvo, Alice Pace, Sylvie and Valentino Leidi, Josy Weiner, Carolyn Harvey, Joy Stafford, Juan Marrero, Pam Murfey, Phyllis Diegel and Tom Ball, Barbara and Bill Farlie, Mary Bukstell, Jonathan Galka, Tom and Eileen Grabowski, Sally Marshall, Patty Springborn, and please forgive me if I have omitted your name. Publicity Team!!! – Every person who took a stack of flyers to distribute, Anne Siren at the Pompano Pelican who wrote a feature article about the show, Sylvie for her magazine placement, the dealers who sent email blasts out to their clients and the COA magazine for placing our flyer in their magazine. Hospitality Committee – The Best lunch EVER at our show! Elaine Alvo and Toni Fisher you rock! Linda and Kevan Sunderland for their food donation and others who brought those delicious salads and desserts. Set up team – Richard Sedlak, Bob Pace, Doug Fisher, Kenneth Brown, Hugh Andison, Gene Everson, Sheila Nugent, Elaine Alvo, Alice Pace and Lorenzo D’Oria whose truck saved the day (again)! Shell donations: Two Collections – Chip Sparling and Randy Allamand, and a special thanks to Carol and Al Brunner for those fabulous shells! And everyone else for taking shells out of their collection for us. Trophy sponsors – You donated over $1K to pay for our trophies. Richard Kent designed a beautiful flyer for us that we distributed for months and also used in newspaper advertisements! His design helped us increase the visibility of our show and helped to make it the great success it was this year. Mary Bukstel created hundreds of beautiful greeting cards for our artistic sales table, working on them all year long. The cards were a great addition to the income from the craft table. Thank you so much!